What does RRI mean to you? Looking back at 2016, it was a good year for Science Shops. 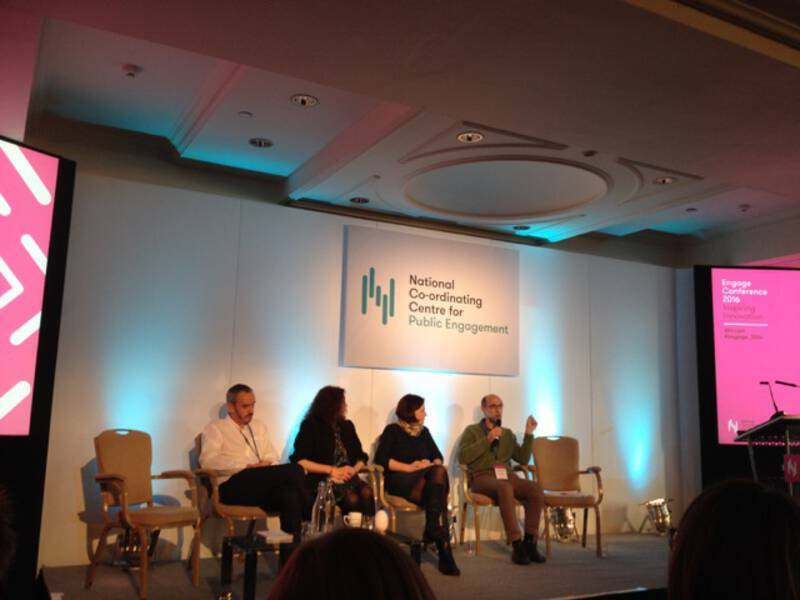 We had an amazing Living Knowledge conference, organised by our great partners from Dublin. Our website got a new look and the Science Shop community grew. The second European Research Framework call specifically on Science Shops was launched and received a huge number of proposals. Which hopefully will lead to a stronger network with a larger number of members and partners. Please let us know if you and your organisation want to be listed in the contact list of our website. What else? There are excellent projects such as the RRI Tools project that ended and other and new projects such as EnRRICH or Sparks gather speed. I’m much obliged there are too many to be listed here. Unfortunately many other aspects in local, national or international and global politics were not that shining. So I thought of quoting the Universal Declaration of Human Rights. Article 27(1) on the sharing of scientific advancements and its benefits I often quote at the beginning of presentations on Science Shops. I tried to find a good one to quote for this last newsletter of the year – and I couldn’t decide. Read them all. Again and again. Have a nice, calm and peaceful end of the year and a successful new one. ‘Let’s hope it’s a good one / without any fear’. (John Lennon & Yoko Ono, 1972). I trust to see many of you at the C2UExpo next May in Vancouver. building up the relationships with community partners, establishing an ecosystem of CBR in Hungary on the other. These internal and external initiatives of ours were taking place within the RRI paradigm, thus here we also would like to show how that frame was utilized and built upon. The very first challenge of our EnRRICH team at Corvinus was to capture and understand RRI for a management education context. Our approach was planned to be open and inclusive, consequently we offered RRI lectures and information sessions for staff members, and designed a series of interactive workshops. By these formats, we envisaged a public and joint meaning making of RRI keys and provided a room for faculty professional development that builds on the notions of responsibility. 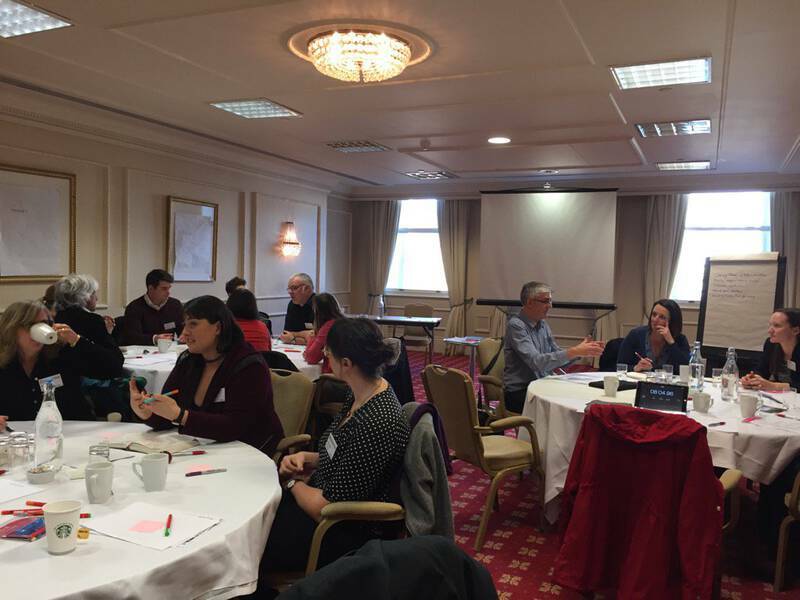 These workshops reached almost one third of the faculty, and made colleagues to reflect on: to what extent their teaching activities support or conflict the policy agendas of RRI. The most interested colleagues continued this process of reflection in autumn 2016, formed groups around policy agendas and have studied their teaching practices in details throughout the semester, assisting each other in this process as supportive micro-communities. In order to establish our Science Shop we are offering workshops on CBR for colleagues during the Faculty Research Week of each semester. First a successful Science Shop – Queen’s University of Belfast – was introduced. It was followed by a workshop where key stakeholders – community partners, students, teaching and research staff, university decision makers, other interested universities – discussed the opportunities and challenges of introducing Science Shops to higher education institutions (HEI) in Hungary. 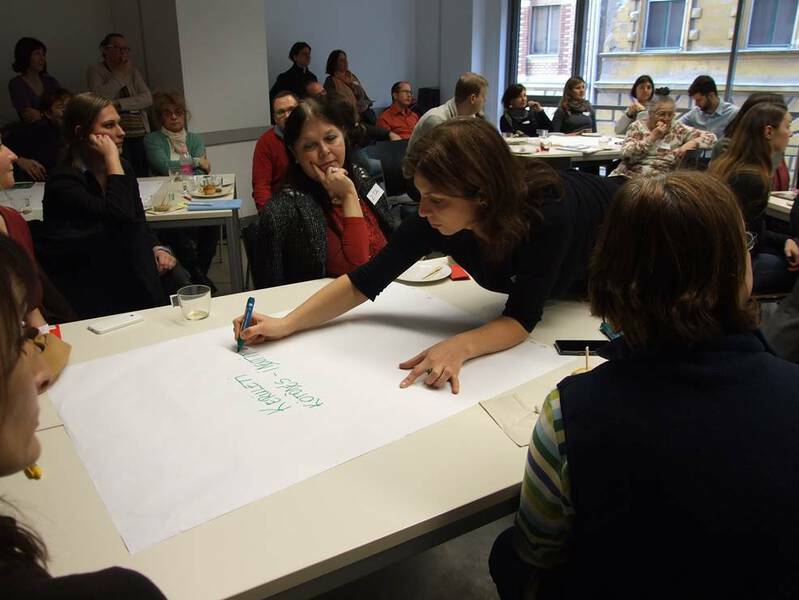 A world café event with a Civil Society Organisation embedded in the direct neighbourhood of Corvinus was organized to faculty members to raise awareness of the closest context of the university, the local district of Budapest and its communities. This resulted in student projects and an invitation to the community radio where the Research Director of Corvinus Business School György Pataki had the opportunity to introduce our Science Shop initiatives and discuss the openness of the university to research requests from its local communities. The latter elements already show how Corvinus reaches out to external stakeholders and communities. Further major steps in this field have been publishing an open call for community research questions together with the Central-European University (approx. 30 applications arrived in two weeks); conference talks and discussions about Science Shops in other HEIs in Hungary; meetings and an open symposium with the other ongoing RRI projects in Hungary: FoTRRIS and SPARKS. Internally we experienced pilots of Science Shop activities, such as the several student research projects for community partners in the course on “Social Entrepreneurship and Civil Economy”. Workshop for engaging colleagues was developed with the trigger question of “how to teach business with non-business organizations?” This is planned to be a recurrent, fairly regular workshop where one community partner introduces its challenges to faculty members with various backgrounds in business and management studies. This first occasion resulted in a handful of research questions and student project ideas; one of them actually becoming a project in a Service Marketing class during the semester. EnRRICH members Andrea Vargiu (University of Sassari), Emma McKenna (Queen’s University Belfast) and Sinead McCann (Dublin Institute of Technology) along with Advisory Board member Henk Mulder (University of Groningen) attended the annual National Co-ordinating Centre for Public Engagement (NCCPE) conference in Bristol on 29 and 30 November 2016. This conference is organised by Advisory Board member Sophie Duncan. Whilst it has traditionally focused on public engagement with research, this year also had a theme on engaged students: the role of engagement within teaching and learning. There was a strong interest amongst people attending the conference in further developing thinking in both policy and practice to support student engagement through academic curricula and EnRRICH members will follow up with attendees in taking this work forward at both UK and international levels. For more information please contact Emma McKenna e.mckenna@qub.ac.uk. 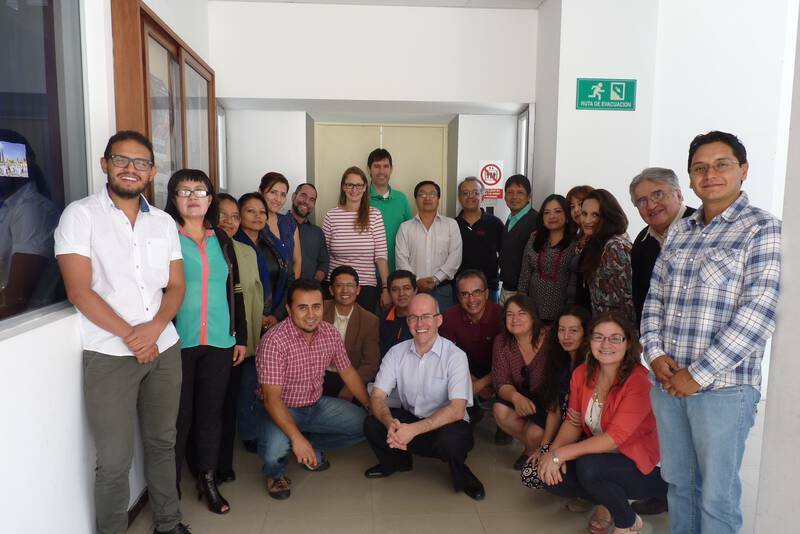 The University of Vechta, Germany is cooperating with the Universidad Técnica del Norte in Ibarra, Ecuador and the Universidad Antioquia in Medellín, Colombia in a project funded by the German Academic Exchange Service (DAAD) that aims at developing and implementing competence-based teaching and learning at South American universities. In 2015 and 2016, international conferences on competence orientation in higher education were organized at the two universities in Ecuador and Colombia to promote scientific exchange as well as seminars with students and faculty staff. The EnRRICH team of the University of Vechta Prof. Dr. Marco Rieckmann and Christine Gröneweg held a seminar "Competencias para una investigación participativa" ("Competencies for participatory research”) from 26.09.-30.09.2016 at the UTN in Ibarra, presenting the Responsible Research and Innovation (RRI) concept, models of participatory research (including Science Shops) and the possibilities of competence-based higher education. The seminar mainly focused on the exchange and discussion of different forms of cooperation between civil society and scientists in research processes as well as the cross-learning from each other. Participatory research is discussed in Latin America, especially in the context of participatory action research and – unlike than in Europe - the Ecology of Knowledge (Ecología de saber). Although RRI as a European concept and Science Shops are unknown among Ecuadorian teachers, other forms of cooperation between citizens and universities exist. 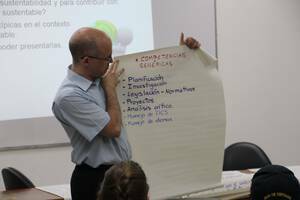 The field of competencies for teachers and students in participatory projects was intensively discussed in workshops and round tables. In addition, every teacher developed an individual plan for his/her own participatory research projects (among others on the subjects “bullying in schools”, “recycling” and “resource use”). About 30 lecturers of different departments and faculties participated in the course. 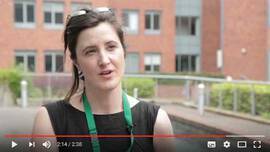 During the 7th Living Knowledge Conference, which took place from 22-24 June 2016 in Dublin, the conference team interviewed some of the guests and asked them what RRI means to them. Eleven short videos of lecturers, university staff, students and community partners give an insight into what values are important to them and how they are already involved in responsible research. 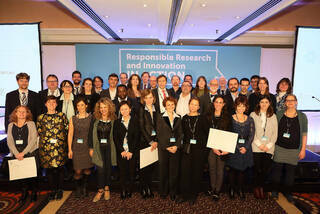 "RRI IN ACTION" was the slogan of the final conference of the RRI Tools project. The conference was held in Brussels from 21 - 22 November 2016 and the EnRRICH project was invited to be part of it. Jozefien de Marrée, the coordinator of the EnRRICH project, was invited as speaker in two sessions. "Opening up research" - this session focused on future strategies and incentives of stakeholder engagement. It tackled diverse ways to open research, including citizen science, Science Shops, and open science practices. "Learning by doing" - this session focused on how we can incorporate the principles and practices of RRI in a responsible and open way of doing in the education of the researchers, innovators and citizens of tomorrow. 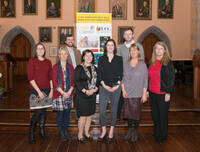 On 6 October University College Cork honoured eight staff members for Excellence in Teaching. The President's Awards for Excellence in Teaching have been made every years since 2002 and they recognise the outstanding efforts of teaching staff to ensure that UCC students receive the highest quality teaching and learning experience. 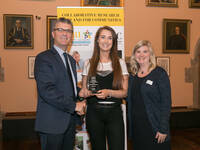 The Awards Ceremony combined presentations and accolades to winners from three separate award schemes: Teaching & Learning; Staff Recognition; and Research. 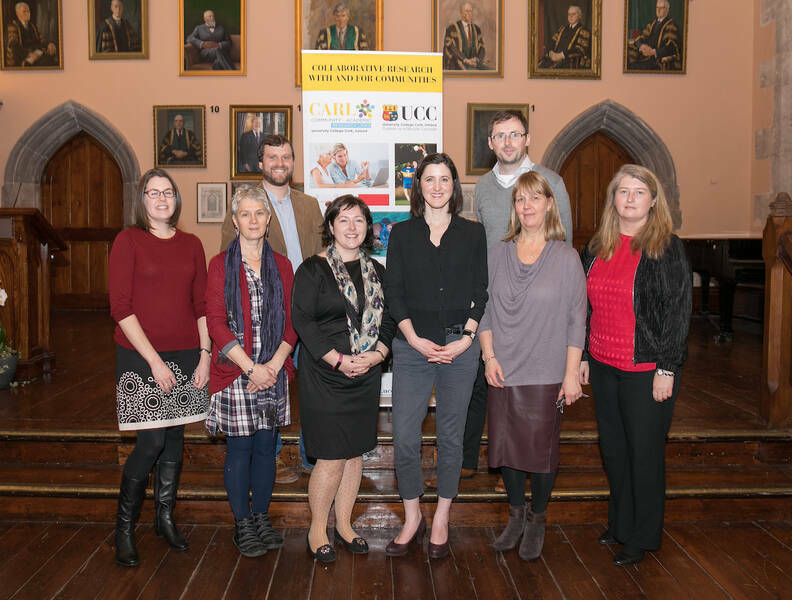 The EnRRICH project is proud to announce that our partners from UCC and CARL - namely Dr Kenneth Burns, Dr Ruth Hally and Dr Catherine O'Mahony - has won the President’s Award for Teaching and Learning. 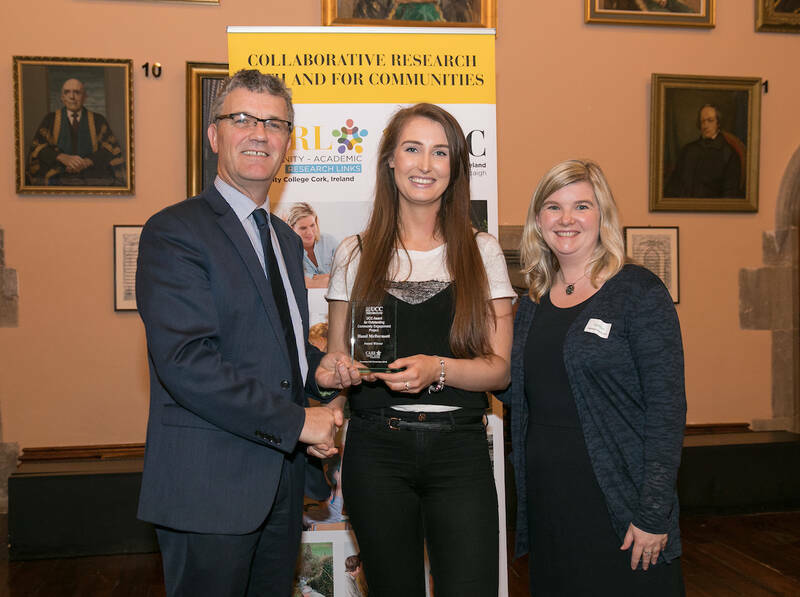 The team award honoured their work in developing and implementing a community-based participatory research (CBPR) module as part of the EnRRICH project. The module and accompanying materials support academic and research staff with embedding CBPR within the curriculum, with a focus on CBPR as an approach to Responsible Research and Innovation (RRI). All materials are open access and available for everybody to introduce and roll-out in their institutions. More information about the module and all materials can be found here. From 19 - 21 October 2016 the Conference "Competence 2016 – International Conference on Competence Theory, Research and Practice" was hosted by Wageningen University & Research in the Netherlands. It was organised by the Education and Competence Studies Group of Wageningen University, whose research is mainly focussed on questions of competence-based education with education for sustainable development being one main topic. 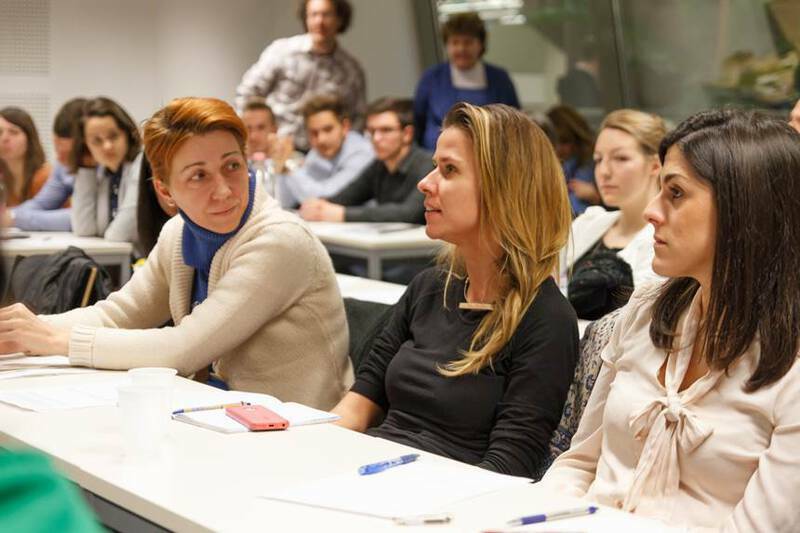 The event addressed the growing field of competence studies, in particular the main themes Competence-based strategy and management, Competence-based education and Competence Domains as goal. The EnRRICH project was represented by the partners from Wageningen University Dr. Valentina Tassone and Hansje Eppink who presented their paper on "Higher Education and Competence for Responsible Research and Innovation (RRI): Towards a Research Agenda" and Prof. Dr. Marco Rieckmann from the University of Vechta, Germany. During the symposium “Sustainability Competence: meanings, possibilities and constraints” Prof. Dr. Marco Rieckmann and Senan Garndiner (University of Vechta) held a lecture on “Developing Anticipatory Competence in Higher Education for Sustainable Development”. The symposium was moderated by EnRRICH Advisory Board member Prof. Dr. Arjen Wals (Wageningen University). During the conference, competence-based practices were reflected. Questions about concept boundaries, alternative concepts, and contradicting interpretations were raised. Conference homepage: www.competence2016.nl. 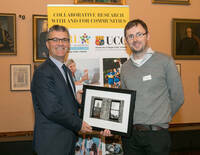 CARL at University College Cork, Ireland and partner in the EnRRICH project has just completed its 50th CBR project. The initiative provides independent research support to Civil Society Organisations, e.g. community and voluntary groups, in the region. The research is undertaken by students in collaboration with the community partners across a wide range of disciplines and usually free of charge. Projects to date have addressed: disability, youth work, provisions for the elderly, regional planning, sexual health, education, post-natal depression, and environmental issues, amongst others. 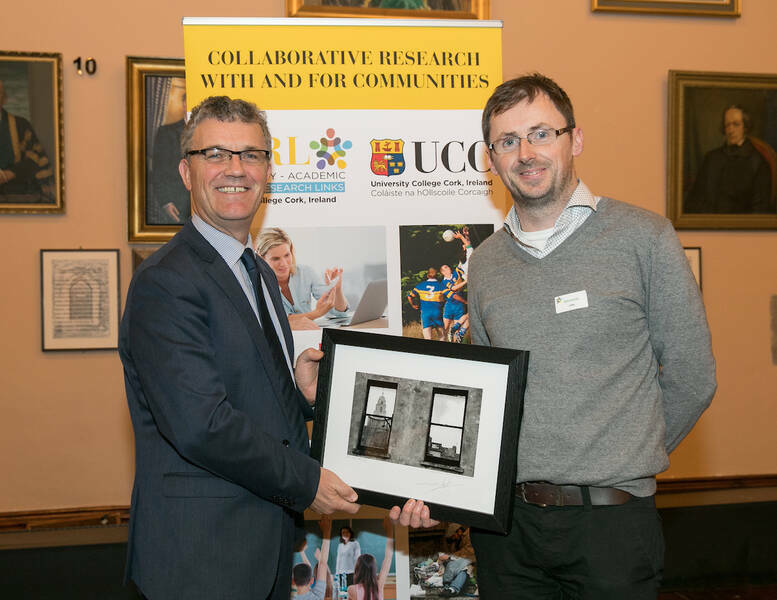 All 50 projects are available open access online at www.ucc.ie/en/scishop/rr. CARL is also just about to appoint it's first full-time post this semester and continue developing projects in STEM courses as well as the social sciences where CARL has been traditionally strong. To mark the occasion, the CARL team organised an event - CARL@50 - which offered a chance to network with University staff and students with a view to engaging in future collaborative projects. There was a showcase of exceptional projects which have resulted in positive change for the community sector whether through supporting advocacy work, enhancing the quality of services, or leveraging project funding, amongst other positive outcomes. E.g. 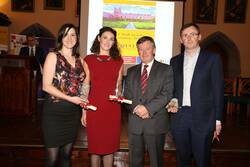 Hazel McDermott, Bachelor of Social Science graduate, won a prize for her research with Cork’s Eating Disorders Clinic. Dr Kenneth Burns was awarded CARL supervisor of the year to recognise his unwavering commitment to supporting students and community partners throughout the duration of their research partnership and beyond. More information about CARL can be found at http://carl.ucc.ie, enquiries can be directed to carl@ucc.ie. This quick guide, published in November 2016, explains what responsible research and innovation really means and why it is so important for modern society. It explores RRI through the lens of the RRI Tools project and provides practical examples of its implementation through a number of case studies and an overview of the RRI Toolkit structure and main contents. 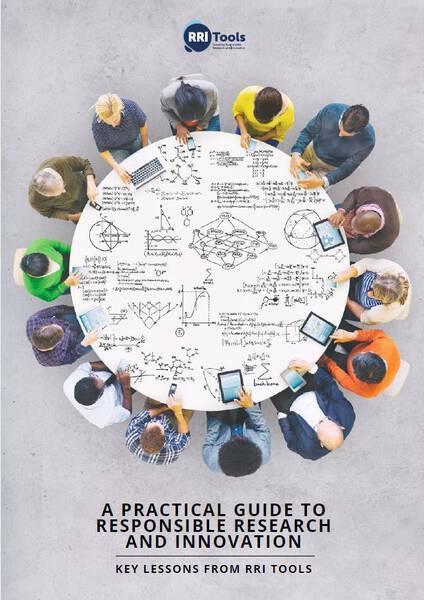 A selection of ‘How To’ guidelines explains how to apply RRI to specific situations, including policy, research and business contexts. Finally, this guide provides five recommendations that can help to make all types of research and innovation more responsible. This document explains how RRI Tools has laid the groundwork for more responsible, acceptable, and ethical science and technology development in Europe – in pursuit of a better, more sustainable and more equitable world. The new version of the Responsible Research and Innovation (RRI) Toolkit been released in November and a community of more than 1.000 individuals and institutions from all over Europe is enriching it. This open online platform was launched by the RRI Tools project to help research and innovation actors across Europe work in a more social, ethical, and sustainable way, a requisite in many European funding calls. The Toolkit contains almost 500 items to put RRI into practice, such as manuals, guidelines, how-tos, inspiring practices, projects, articles and reports. To help visitors find what they need, the website also includes several levels of navigation, first to understand what RRI is and then to browse through the Toolkit, depending on the experience and needs of users. All these features are now available in 18 languages. The online platform is participatory. Visitors can create an account, join the RRI Community, upload their own resources to the Toolkit and participate in the forum discussions. In addition, the events page and the blog allow the community to stay abreast of the latest news and events related to Responsible Research and Innovation. 1. The introduction page – “What is RRI” – helps all users understand what the emerging and evolving concept of Responsible Research and Innovation covers. 2. Five pages are dedicated to each of the research and innovation stakeholders: policy makers, the research community, the education community, business and industry and civil society organizations. They explore what RRI means to them and suggest a selection of resources that would especially fit their needs. 3. Six pages specifically address the key topics covered by RRI: ethics, gender equality, governance, open access, public engagement and science education. These pages also include some recommended resources on each of these topics. 4. 28 how-tos have been developed as practical guides to help visitors navigate through the Toolkit and find concrete answers to specific challenges they might face, such as how to set up a participatory research agenda, how to do a business plan embedding the RRI principles or how to advocate civil society organizations’ ideas and set up a project proposal. 5. At the core of the RRI Toolkit, the search engine allows users to look up the resources they need, filtering them by language, type of resource (tool, inspiring practice, project or library element), expertise required, policy agenda, target stakeholder group and more. 6. The Self-Reflection Tool allows users to reflect on the implementation of RRI in their daily work and on which strategies are most useful for their practices. Training and Communication resources: Throughout 2016 the project provides more than 90 training sessions on RRI and the Toolkit. The associated resources are available online for re-use, as well as presentations and videos to understand more in-depth what Responsible Research and Innovation is about. Communication materials such as a project brief, a poster or a leaflet of the project can be found in several languages on the media room. The RRI Tools final conference took place from 21 - 22 November 2016 in Brussels. An agora designed to friendly share and analyse how research and innovation can be further built upon more open and responsible foundations, this event gathered over 250 participants. Nearly 80 speakers shared their views with the public on the future of openness of research and innovation and the social impact of science. 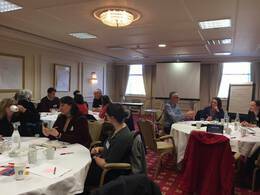 On Monday 21st, the sessions reviewed the main goals and outcomes of the RRI Tools project, taking stock of what we have achieved so far. On Tuesday 22nd, the sessions aimed at opening the perspectives on Responsible Research and Innovation in the other parts of the world, and in the future, beyond the 2020 horizon. Check out the conference highlights here. CUExpo is a Canadian-led international conference held every two years and designed to showcase the best practices in community-campus partnerships worldwide, to create a space for collaboration around key issues and to foster ideas, connections, and frameworks with the purpose of strengthening our communities. The conference allows community members, universities, colleges, government, and nonprofit organizations to work together to create an innovative learning environment where research, knowledge, and relationships can be shared and cultivated over a conference program. 261 proposals have been submitted and are now being checked. The registration is now open and early birds receive 10% discount on the regular rates until 31 January 2017. All citizens and organisations are welcome to contribute to the interim consultation of Horizon 2020. The consultation is still online until 15 January 2017. Please contribute! Contributions are particularly sought from researchers, entrepreneurs, innovators and all types of organisations on different aspects of Horizon 2020 implementation. You also have an opportunity to upload a position paper for the interim evaluation. As result the European Commission will publish a Staff Working Document, including a summary of the results of the consultation, by mid-2017. Enter the consultation at https://ec.europa.eu/research/consultations/interim_h2020_2016/consultation_en.htm. The results of the public consultation on Horizon 2020 ‘Science with and for Society’ Work Programme 2018-2020, which took place until July 2016 can be found here. The analysis of the 2014 survey is online at http://ec.europa.eu/research/consultations/swafs/general_findings.pdf. On 1 November 2016, the first joint project of wissnet - the network of German Science Shops - was launched. 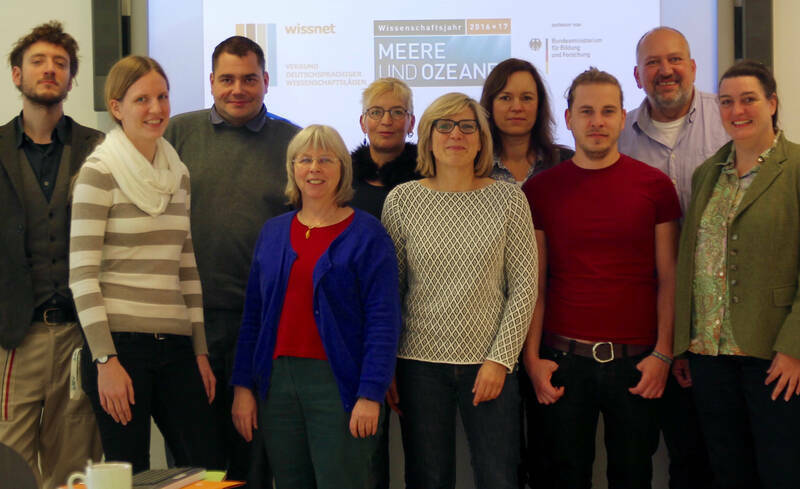 The one-year project "Meer davon - Berlin liegt an der Nordsee" will engage citizens into topics related to seas and oceans. The relevance of marine research and oceanology for one's own action shall be explored in various events such as workshops, science cafés, simulation games, open labs and DIY meetings. The project is funded in the framework of the Science Year 2016*17 "Seas and Oceans" which explores the seas and oceans, their protection and sustainable use. The Science Year is an initiative of the German Federal Ministry of Education and Research which aims to communicate science to the public and to support the dialog between research and society. The project partners are: Science Shop Uni Vechta/Cloppenburg (coordinator), Bonn Science Shop, Basis.wissen.schafft Berlin, Kubus TU Berlin, Potsdam Science Shop, Science Shop Wissensdialog, Technologie und Training – WTT e.V. Sachsen. More information (in German) about the project can be found at the website of wissnet or contact Dr. Daniel Ludwig at daniel.ludwig@uni-vechta.de. League of European Research Universities, Advice Paper No. 20, October 2016, Belgium. Citizen science, the active involvement of non-professional scientists in research, is experiencing an upsurge of interest. Activities range from small projects by groups with a common interest to large international projects, which involve professional scientists and research institutions. Citizen science can involve a vast range of activities, from gathering data in remote regions of the planet to crowdsourcing over the internet. Smart phones and other low-cost instruments are opening up new opportunities for public engagement with research. Thus scientists at many LERU universities and elsewhere are actively involved in managing citizen science projects in various domains. The paper analyses trends in citizen science, formulates actionable guidelines for scientists and gives recommendations for universities, policymakers and funders. Ferretti, J. et al. (2016): Reflexionsrahmen für Forschen in gesellschaftlicher Verantwortung. BMBF-Projekt „LeNa – Nachhaltigkeitsmanagement in außeruniversitären Forschungsorganisationen“, Berlin. 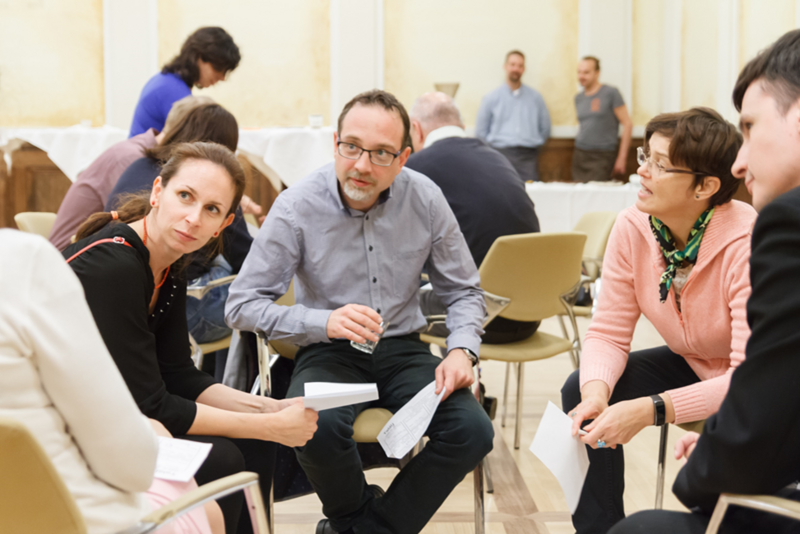 As part of the joint project "Sustainability in non-university research organisations" (LeNa - www.nachhaltig-forschen.de) Fraunhofer-Gesellschaft, Leibniz-Gemeinschaft and Helmholtz-Gemeinschaft developed the "Framework for Research in Societal Responsibility". Research in Societal Responsibility is understood as an integral part of sustainability management of research institutions at all levels. The framework tends to support the systematic reflection of research processes with regard to societal responsibility. The focus is on "how" is the research undertaken and not on "what" is the focus of the research. The framework can be downloaded here (in German). The e-book summarizes the main findings of a global study titled ‘Building the Next Generation of Community-Based Researchers’ (a.k.a. the Next Gen project), funded by the Social Science and Human Research Council of Canada (SSHRC). The overall aim of the Next Gen project was to increase access to high quality training in Community-Based Research (CBR) within Higher Education institutions (HEIs) and civil society organizations (CSOs). The project aimed to understand the current state-of-the art in pedagogies and strategies for building CBR capacities, and to work towards the strengthening of the existing training fieldwork and the theoretical and curricular content on participatory research within and outside the academia. This book outlines a number of important trends, approaches and challenges in the field of training the next generation of researchers in CBR; through a comparative analysis of 21 institutional case studies of CBR training providers from around the world. 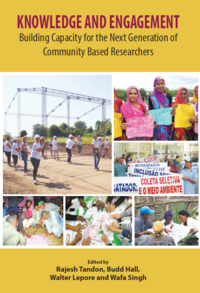 The book also includes the results of a global survey of training CBR in HEIs & CSOs. Download the e-book here (large document). In today’s society a variety of challenges need attention because they are considered to affect our well-being. Many of these challenges can be addressed with new innovations, yet they may also introduce new challenges. Communication of these new innovations is vital. This importance is also addressed by the concept of Responsible Research and Innovation. The commentary draws on a dataset of 196 research projects and discusses the two research streams of Science Communication and Responsible Research and Innovation and how they are complements to each other. It concludes with suggestions for practitioners and scientists. Read the comment here. The Open Science Conference 2017 is the 4th international conference of the Leibniz Research Alliance Science 2.0. It is a continuation and development of the former Science 2.0 Conference. It is dedicated to the Open Science movement and provides a unique forum where researchers, librarians, practitioners, politicians, and other important stakeholders can discuss and exchange their ideas and experiences. The thematic focus 2017 is on “open educational resources”. Social Work Research is linked closely to the complex world of social work and to different stakeholders and interests within the field – practitioners, service users, teachers, students, politicians, and administrators. This diversity of interests and different stakeholders raises a range of challenges in social work research. Researchers in social work are expected to know about the different interests and to collaborate with many partners within the research processes. All partners in research processes must be aware of the melting pot they are part of when collaborating – both to make it possible to safeguard their own interests and to be able to participate in the processes in the complex meetings. The seventh European Conference for Social Work Research (ECSWR2017) will focus on the research challenges originating from these meetings. The conference will explore how universities collaborate in research, addressing issues of high national, regional and global priority: water, energy, and the related environmental and sustainability challenges. In tackling these specific and strategic topics, the conference will discuss more generally the question how Arab and European universities can work closer together in promoting research and research based education, and will also explore relevant policy and funding frameworks. Involving university leadership along with policy makers, it will seek to provide concrete recommendations for policy making at inter-regional level. C2Uexpo is a biannual conference that explores the edge of community-college-university partnerships as catalysts for social innovation. The event will attract 500 delegates from around the globe to Simon Fraser University (Vancouver, Surrey, Burnaby, British Columbia) next year. 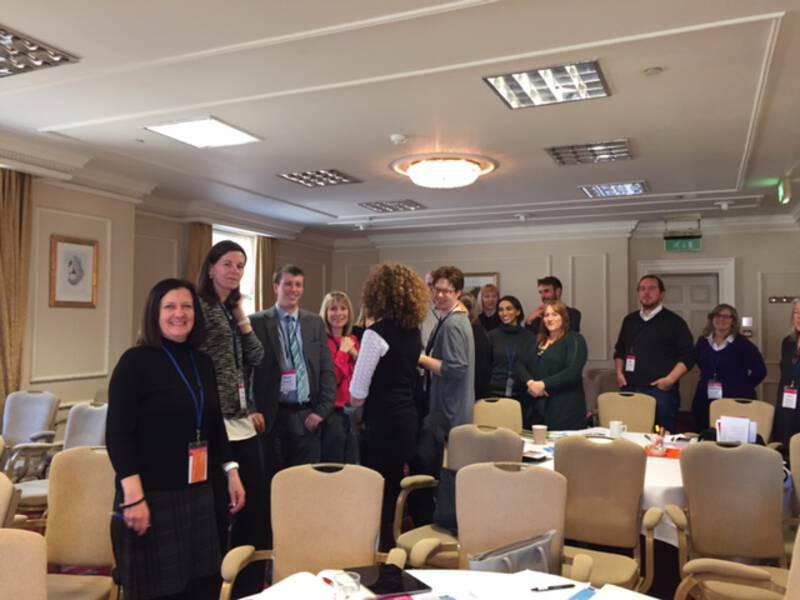 4 themes to spark dialogue: the engagement process: powerful questions, powerful questioning, the C2U project life cycle, comprehensive C2U engagement, C2U without borders. Call for proposals is open until 13 November 2016. As part of a partnership between the Association francophone pour le savoir – Acfas and the University of Lorraine, Science & You will cross the Atlantic and become the “Journées internationales de la culture scientifique – Science & You”. The scientific culture event is open for all stakeholders in the scientific, cultural and entrepreneurial sector, policy makers and all lovers of sciences alike. The event will be dedicated to the sharing of best practices around using digital technologies as tools to facilitate the dissemination of scientific knowledge. ICTEL is an intellectual hub for academic discussions and an excellent opportunity for presenting new researches, exchanging information and discussing current issues. The conference aims to improve further the development of knowledge in these fields and to promote international dissemination of knowledge and development of cross-national academic fraternity. New ideas, innovations, theoretical, methodological and empirical knowledge, as well as problem solving techniques in various disciplines, themes and areas of education will be addressed in the programme. With the motto Beyond HORIZONs – Framing the Future the European science events association (Eusea) wants to frame the future of public engagement in Europe and beyond. Upcoming funding policies will be discussed with stakeholders from the European Commission, and participants will get a glimpse of what’s new and upcoming in the fields of science-society dialogues and public engagement strategies even beyond HORIZON 2020. The purpose of the 7th ISSL is to focus on transitions in higher education and the role that service-learning plays. The focus will be on experiences of transitions from across the globe and how service-learning transforms students to critical citizens, faculty to engaged scholars and communities into living knowledge incubators. These focal points will be threaded throughout a variety of presentation types and formats to allow for meaningful dialogue among academics, community partners, students, and other professionals. The Ecsite annual conference is open to everyone interested in public engagement with science. The event will balance large crowds and a friendly family atmosphere, broad thematic scope and focused state of the art sessions, international perspectives and European touch, spotless organisation and room for surprises, peer collaboration and friendly criticism. Taking up “Life Everywhere” as a motto, Ecsite invites everybody to celebrate life, celebrate the extraordinary diversity of forms evolving in our planet for millions of years, celebrate our existence. Call for proposals closes 16 October 2016. The 12th International Conference of the European Society for Ecological Economics will be held under the theme "Ecological economics in action: building a reflective and inclusice community". It aims to bring together diverse sets of actors who are engaged in co-producing ecological economics insights and advice for responsible and creative pathways towards sustainability. The conference seeks to open up disciplinary boundaries through collaboration and discussion, as well as through critical engagement and mutual learning with practitioners and local community efforts that aim to realise transformation towards sustainability. The call for proposals closes for special session proposals on 7 October 2016 and for abstracts on 25 November 2016. The annual conference of the International Association for Research on Service-Learning & Community Engagement is a scholarly venue to disseminate new knowledge on service-learning and community engagement. The focus of presentations, symposiums, and keynotes is on research incorporating a variety of theoretical, methodologies, and perspectives. The conference also serves as a gathering place for networking and association business meetings for members. A significant component of the conference is the mentoring of graduate students and new faculty members interested in advancing their own research agendas in this field. The European Learning & Teaching Forum provides a platform for the exchange of experience on and good practices in learning and teaching in higher education among EUA members and other higher education stakeholders. Within universities, the Forum aims to target vice-rectors for academic affairs, deans, programme directors, academic staff, and researchers in the field of learning and teaching. It also wishes to identify and better engage with dedicated policy makers, networks and organisations, thus strengthening the voice of EUA in ongoing policy debates on changing learning landscapes. The views expressed in the notes, messages and links are those of the authors and owners of the website and are not necessarily endorsed by the publisher. Whilst every care has been taken, the publisher does not accept any liability for errors that may have occurred. Editors: Norbert Steinhaus, Laura Steinhaus and Michaela Shields, Wissenschaftsladen Bonn e.V., Reuterstr. 157 - D-53113 Bonn, Tel +(49(0) 228 201 61 22, Fax +49 (0)228 201 61 11, norbert.steinhaus@wilabonn.de, laura.steinhaus@wilabonn.de, michaela.shields@wilabonn.de, Living Knowledge Discussion List (LIVINGKNOWLEDGE-L@LISTS.UCC.IE), Living Knowledge Website: www.livingknowledge.org. The newsletters are archived on the Living Knowledge website. Please recommend this newsletter to your colleagues and partners. You can subscribe or unsubscribe to the newsletter by sending a message to livingknowledge@wilabonn.de.